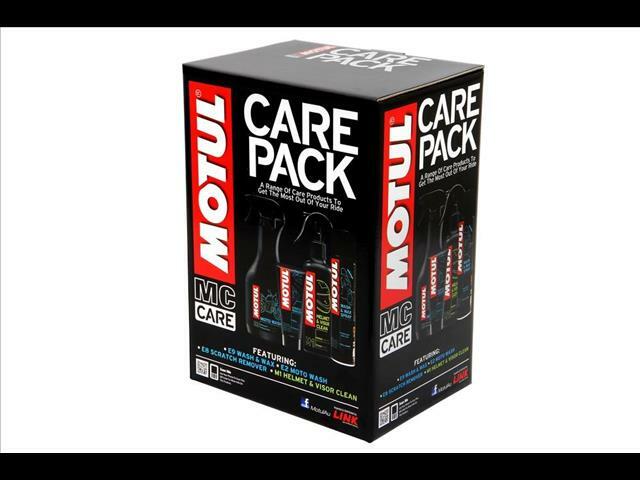 Motul&apos;s Road Care Pack offers great value for money, and comes with an impressive range of products that will assist in keeping street bikes and their riders looking their best. A terrific gift idea for the enthusiast and new rider alike. Wash & Wax - Wash & Wax Spray is a waterless cleaner that cleans and provides shine to all surfaces. Leaves a protective wax film for extended effectiveness. Helmet & Visor Clean - Helmet & Visor Clean cleans the outside of the helmet and visor without leaving any marks. Anti-insect effect. Suitable for all helmets and for all visor technologies. Scratch Remover eliminates superficial scratches from any painted or varnished surfaces: motorcycle fairings, helmet, etc. **Chrome & Alu Polish has substituted the Scratch Remover for the interim. MOTUL Chrome & Alu Polish is a cream which cleans, restores, and shines chrome and aluminum parts on the bike.